This Act may be cited as the Mental Health (Amendment) Act, 2018. “representative” means the spouse, parent, guardian, next of kin, or court appointed representative of the person suffering from mental illness, having legal capacity to make decisions on behalf of the person with mental illness. ensure that the rights of a person with mental illness is protected and safeguarded. that interventions for the care and protection of persons with mental illness are based on objective information and methods and monitoring mechanisms and regular evaluations are established, thus ensuring transparency in the management of facilities and care of persons with mental illness. the medication and methods of care, rehabilitation and treatment to be administered to persons with mental illness. provide adequate resources to ensure a person with mental illness lives a dignified and life outside the mental health facility by financing efforts towards reintegrating the person in to the community. prepare and publish reports containing statistical or other information relating to programmes and effect of the programmes carried out by the county in relation to persons with mental illness. The county executive committee member may delegate some or all the functions under this section, to a committee or an officer within the county public service. receive reasonable care, assistance and protection from their family and the State. 3A (1) Every person has a right to the highest attainable standard of mental health services. In the provision of mental health care, priority shall be given to community health and primary mental health care and treatment as opposed to institutionalization of the person with mental illness. In determining the type of mental health care and treatment suitable under subsection (3), a mental health practitioner shall take in to account the mental health condition of the person with mental illness. aims at reducing the impact of mental illness and improving the quality of life of the person with mental illness through the provision of the relevant clinical and non- clinical care. Where a person with mental illness has been discharged from a mental health facility, the person in charge shall ensure that the person with mental illness has access to specialized and personalized after- care services necessary to enable the person live a decent and dignified life outside the mental health facility. obtain the written consent of such person before administering any treatment. (2) Where a person with mental illness is incapable of making an informed decision on the need for treatment, such consent shall be sought and obtained from the representative of that person. 3C. (1) A person with mental illness has a right to participate in the formulation of their treatment plans. (2) Where a person with mental illness is incapable of exercising the right under subsection (1) due to the nature of the illness, the representative shall be entitled to participate in the formulation of the treatment plans. 3D. (1) A person with mental illness shall have the right of access to medical insurance for the treatment from public or private health insurance providers. The national and county governments shall provide health insurance for the care and treatment of persons with mental illness. An insurance company or person providing health insurance services shall not discriminate against a person with mental illness or subject a person with mental illness to unfair treatment in obtaining the necessary insurance cover. Any person or health insurance company that contravenes the provisions of this section commits an offence and shall be liable, on conviction, to a fine not exceeding five million shillings, or to imprisonment for a term not exceeding three years, or to both. 3E. (1) A person with mental illness has the right to protection from physical, economic, social, sexual and other forms of exploitation. have the right to receive remuneration for any work done, similar to that payable to a person without mental illness. A person who contravenes the provisions of this section commits an offence and shall be liable, upon conviction, to imprisonment for a term not exceeding three years or a fine not exceeding one million shillings, or both. A person who witnesses any form of abuse against a person with mental illness shall report the incident immediately to the police, the Board or any other competent authority. 3F. Subject to the Criminal Procedure Code, a person shall not be received or detained for treatment in a mental health facility unless the person is received and detained in accordance with this Act. 3G. 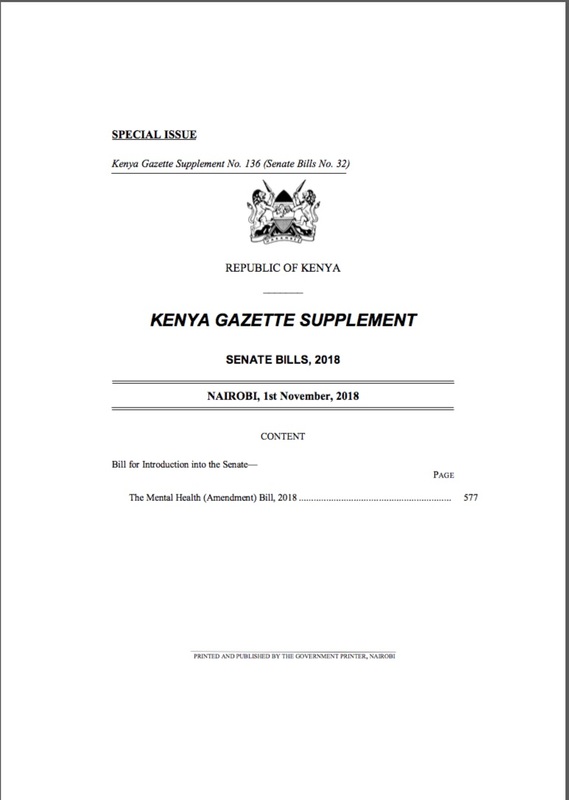 (1) Every person with mental illness shall have the right to exercise all civil, political, economic, social and cultural rights guaranteed under the Constitution and any other written law in force in Kenya. The exercise of the rights under subsection (1) shall only be limited to the extent and in the manner provided for under this Act. Any representations made by a person with mental illness or the representative of such person shall, on request, form part of the records of the person with mental illness. exceptional circumstances where such information may be withheld. 3I (1) All information regarding the care and treatment of a person with mental illness is confidential. is in the best interest of the person with mental illness. 3J. (1) A person with mental illness is entitled to choose and appoint another person to represent them in any manner, including in any complaint procedure or appeal. Where a person with mental illness is unable to exercise the right under subsection (1) the representative of the person may appoint a person to represent the person with mental illness in any manner, including in any compliant procedure or appeal. A person with mental illness, the representative of the person or a person appointed under subsection (2) is entitled to, where necessary, the services of an interpreter who shall be made available free of charge. attend, participate and be heard in any hearing. 3K. (1) A person with mental illness has a right to recognition before the law and shall enjoy legal rights on an equal basis with other persons in all aspects of life. Upon application, the court may make a determination whether a person with mental illness has legal capacity. Where, under subsection (2), the court determines that a person lacks legal capacity, the court shall appoint a representative to manage that person’s affairs in accordance with the provisions of this Act. a clinical officer nominated by the Clinical Officers Council. the Director of Mental Health, who shall be the secretary to the Board an ex officio member of the Board. (2) (b), (c), (d), and (e) by notice in the Gazette. (b), (c), (d) and (e), shall hold office for a period of three years and shall be eligible for re- appointment for one further term. is disqualified from being appointed under the provisions of any other written law. diversity of qualifications of the persons being appointed. (2E) The Secretary to the Board shall be the Chief executive officer of the Board. (2F) The procedure for the conduct of business and affairs of the Board shall be as set out in the schedule. is removed from office under any of the circumstances specified in section 4B. any other ground that would justify removal from office under any written law. 4C. The Board may, by resolution either generally or in any particular case, delegate to any committee of the Board, the county mental health council, or to any member, officer, employee or agent of the Board, the exercise of any of the powers or the performance of any of its functions or duties under this Act or under any other written law. (hb) to prepare reports on prevalence of mental illness in the country and in particular to articulate in the reports an analysis of the specific types of mental illness recorded in every county. There is established the office of the Director of Mental Health which shall be an office in the Public Service. (1A) The Director of Mental Health shall be competitively recruited and appointed by the Public Service Commission. performing any other duties as may be assigned by the Board. The principal Act is amended by deleting section 7. The remuneration of the Board shall be determined by Cabinet Secretary in consultation with the Salaries and Remuneration Commission. (2) The Board may, by notice in the Gazette, designate a national referral health facility or any other national government facility as a mental health facility. designate a county health facility in the respective county as a mental health facility. A person who intends to establish a mental health facility or provide mental health services in an existing county health facility shall make an application for designation of the facility to the respective county executive committee member in the prescribed form. (4A) An application under subsection (4) shall be submitted together with the prescribed fee and such other information as the county executive committee member shall require. The Cabinet Secretary, in consultation with the Board and the Council of County Governors, shall make rules for the control and proper management of mental health facilities including setting the standards to be maintained for mental health facilities. A level 3, 4, 5 and 6 health facility which is designated as a mental health facility under this section shall provide for in-patient and out-patient treatment of persons suffering from mental illness. (6A) Every private mental health facility established under subsection (7) (b) shall have facilities for inpatient and out-patient treatment of persons suffering from mental illness. a private mental health facility. 9B. (1) A person who intends to establish a mental health facility under section 9A shall submit an application to the Board member in the respective county in the prescribed form together with the prescribed fee. A premises shall not be used as a private mental health facility under section 9A unless authorized for such purpose by the Board. A private mental health facility shall be subject to the standards and regulations affecting mental health facilities under this Act. A person aggrieved by a decision of the Board under this section may appeal to the High Court, and in any such appeal the High Court may annul or vary the decision of the Board as it considers fit. body corporate, to a fine not exceeding ten million shillings. In addition to the penalty imposed under subsection (1), the Board may lodge a complaint with the relevant professional body, to which that person is a member, for the institution of disciplinary proceedings against that person. the number of voluntary or involuntary patients who have died in the course of treatment in the mental health facility. 9E. (1) A person with mental illness shall not be physically restrained or secluded except in accordance with the provisions of this Act, the prescribed procedures and upon authorization by a mental health practitioner. Physical restraint or seclusion shall only be used where it is the only means available to prevent immediate or imminent harm to the person with mental illness or other people. allow the person with mental illness to co-habit peacefully with other users within the mental health facility or the person’s family, or with members of the community. The mental health facility shall ensure that all instances of physical restraint or seclusion, their reasons, nature and extent are recorded in the medical records of the person with the mental illness. A person with mental illness who is restrained or secluded shall be kept under humane conditions and shall be under the care and regular supervision of a mental health practitioner within the facility. The person in charge of a mental health facility shall, within twenty-four hours, give notice of the restraint or seclusion of the person with mental illness to the representative of the person with mental illness. The review of the mental health status of a person with mental illness under seclusion or restraint shall be carried out in accordance with Part X of this Act. 9D. (1) The mental health practitioner shall not administer any mental health care, treatment or admit a person under this Part without the person’s informed consent or that of the person’s representative. consent is written and documented in the person with mental illness’ records. The principal Act is amended by deleting the heading “PART V- VOLUNTARY PATIENTS”. be referred to an appropriate mental health facility. Where a person below the age of eighteen years requires admission to a mental health facility for treatment under subsection (1), the parent or guardian of that person shall submit a written application in the prescribed form to the person in charge of a mental health facility for the admission of the child. Upon receiving a person under this section, the person in charge of the mental health facility shall, within seventy-two hours, review or cause the condition of the person to be reviewed. prescribe the form to be filled before voluntary admission. The principal Act is amended by deleting the heading “PART VI- INVOLUNTARY PATIENTS”. hinder the provision of appropriate treatment that can only be given by admission to a mental health facility in accordance with the principle of the least restrictive alternative. where persons in (a), (b) and (c) are not available or willing to make the application, by any other person. the circumstances in which the application is made. whether the treatment requires admission or whether it can be administered to the person as an out-patient. (1D) The person in charge under subsection (1) shall only detain the person for the duration necessary to stabilize the person with mental illness and provide mental health care services to the person. A determination under subsection (1) shall cease to have effect on the expiration of fourteen days from the last date on which the person to whom the determination relates was examined by a mental health practitioner. A mental health practitioner shall not recommend that a person received in to a mental health facility as an involuntary patient under subsection (1), be admitted for a period exceeding three months. (6A) A person in charge may extend the period under subsection (6) for one further period not exceeding three months. (6B) Despite the foregoing provisions, an involuntary patient under this section shall not be retained in a mental hospital for a continuous period exceeding six months. the time required to comply with substantive procedures would cause delay and lead to harm to the person with mental illness or to other people. given the necessary treatment based on the assessment carried out by a qualified medical practitioner or other accredited mental health practitioner. any other representative of the person. in any case for a period longer than seventy –two hours. any other representative of the person with mental illness. A police officer shall deliver the person in the officer’s custody under subsection (1), to a mental health facility within twenty-four hours. (2A) The police officer shall bear the burden of proof that the person was delivered to a mental health facility as required under subsection (2). make the necessary arrangements for the person’s treatment and care. The principal Act is amended in the heading of Part VIII by deleting the words “Armed Forces” and substituting therefor the words “Kenya Defence Forces”. Where any member of the armed forces suffers from mental illness while away from his armed forces unit, and is in any circumstances admitted into a mental health facility, the person in charge shall inform the nearest armed forces unit directly or through an administrative officer or gazetted police officer. If a member of the armed forces admitted to a mental health facility under this section ceases to be a member of the armed forces while admitted, the relevant authority in the armed forces shall inform the person in charge of that fact and the patient shall be deemed to be an involuntary patient under section 14 admitted from the date the information is received. In this section reference to the armed forces shall be construed to mean Kenya Defence Forces. Where it is necessary to admit a person suffering from mental illness from any foreign country into any mental health facility in Kenya for observation or treatment, the Foreign Government or other relevant authority in that country shall apply in writing seeking the Board’s approval to admit the person. a warrant and other documents duly authorising the person’s detention in and removal from the foreign country. that the admission in to a mental health facility in Kenya has been found to be necessary. Before admitting a person under this section, the person in charge of a mental health facility shall ensure that the requirements under subsection (1A) have been satisfied. (3A) The requirements under subsection (1A) shall be sufficient authority for the conveyance to, admission and treatment of a person under this section. words “his report on the findings” appearing immediately after the words “to the Board” in paragraph (b) and substituting therefor “the report on the examination under paragraph (a)”. (2) A private mental health facility admitting a person under this Part may charge such fees and in such manner as the Cabinet Secretary for the time being responsible for finance in consultation with the Council of County Governors, may from time to time approve in writing. any other matters related to the mental health status of the person with mental illness. The Board in consultation with the Cabinet Secretary and the Council of County Governors, shall prescribe in regulation the procedure for review under this Act. if the person is dissatisfied with the decision of the Board, a further appeal in the third instance shall lie in the court. 21 (1) The person in charge of a mental health facility may, by order in writing and upon the recommendation of the medical practitioner and mental health practitioner in charge of the person’s treatment in the mental health facility, order the discharge of the person admitted to the mental health facility and that person shall thereupon be discharged as having recovered from mental illness. A person with mental illness shall be discharged from the mental health facility under subsection (1) where the medical practitioner and the medical health practitioner in charge of managing the person make a decision that the person can no longer receive any other or further treatment from a mental health facility and appropriate efforts are being made towards re-integration of the person into the community, and for specialized and personalized after-care service. An order under this section shall not be made regarding a person who is detained under the Criminal Procedure Code. While exercising the powers under subsection (1), the person in charge of the mental health facility shall, with in forty-eight hours, consult the mental health practitioner in charge of the person’s treatment in the mental health facility. A relative or friend who takes a person from a mental health facility under this section but is subsequently unable or unwilling to continue to take care of the person, shall report the matter to the person in charge of the mental health facility from which the person was taken and the person in charge may admit the person back to the mental health facility under the terms and conditions the person with mental illness had been admitted before delivery to the relative or friend. may at any time during such custody and upon the recommendations of the medical practitioner and the mental health practitioner in charge of the person’s treatment in the mental health facility order that the person be discharged as having recovered from mental illness. A person may, by order of the Director or the relevant county executive committee member, as the case shall be, be transferred from one national referral mental health facility to another national referral mental health facility or from one county mental health facility to another county health mental facility as the case may be. is necessary for the purpose of obtaining specialized treatment for such person. the representative of the person with mental illness. in subsection (2) by deleting the words “hospital to which the transfer is made a certified copy of the order of the Director” appearing immediately after the words “charge of the mental” and substituting therefor the words “health facility to which the transfer is made a certified copy of the order of the Director or the relevant county executive committee member as the case may be”. Section 24 (1) of the principal Act is amended by deleting the word “disorder and who desires that the person, whether admitted into a mental hospital” appearing immediately after the words “suffering from mental” and substituting therefor “illness and who desires that the person, whether admitted into a mental health facility”. a person under whose care or charge the person with mental illness is. (b), (c) (d) or (e), an affidavit duly executed by the person waiving their right of make an application in accordance with the provisions of subsection (1). representative of the person with mental illness. Despite the provisions of subsection (3) the court may make an order for the service upon any other person to whom, in the opinion of the court, notice of the application should be given. The court may waive the requirement for service under subsection (3)(a) if the court considers service impracticable, inexpedient or would be ineffectual. person to be examined by a qualified registered mental health practitioner. an order making provision for the payment of the person’s debts. The court may appoint a manager of the estate of a person with mental illness for the purposes of safeguarding the property of that person. The court shall, by notice in the Gazette, inform the public of the appointment of a person as the manager of the estate of a person who is suffering from mental illness. Within fourteen days of the Gazette Notice under subsection (3), any person may lodge an objection to the person appointed as manager. 29. (1) Where a manager is appointed under this Part, the court may, upon considering the nature of the property whether movable or immovable, and subject to subsection (2), make such orders as the court may consider necessary for the management of the estate by the manager. invest in any securities other than those authorized under the Trustee Act. in the purchase of immovable property under the authority of section 4 (1) (d) of the Trustee Act without prior consent of the court. A manager shall perform the manager’s duty under this Act responsibly taking into account the best interests of the estate of the person who is suffering from mental illness. Every conveyance or other instrument made pursuant to an order of the court under this Part shall be valid. a statement of debts owed by or due to such person with mental illness. Upon payment of such fee as may be prescribed, the representative of a person with mental illness or any interested person may inspect and obtain a copy of any inventory, statement or account delivered to the court and to the Public Trustee pursuant to subsection (1). The Public Trustee shall report annually to the Cabinet Secretary and the Board on all accounts under subsection (1). Where a person, by petition to the court, disputes the accuracy of any inventory or statement of any annual account made under this section, the court may summon the manager, inquire summarily into the matter and make such orders as it considers appropriate. 31. (1) A manager who contravenes the provisions of this Part commits an offence and shall be liable, upon conviction, to imprisonment for a term not exceeding three years or a fine not exceeding two million shillings, or to both. (2) Any property of a person who is mentally ill which is lost due to maladministration of the person’s estate shall be a civil debt recoverable summarily from the manager’s estate. may appoint any other person as manager. accounts to the new manager for all money received or disbursed by the person in connection with the property. The person in charge of a mental health facility or a mental health practitioner in charge of any patient in the mental health facility shall forward all letters written by the patient and addressed to the Board or relevant county executive committee member, or to any member of the Board as soon as practicable after such letters come to the notice of the person in charge. A person in charge of a mental health facility and a mental health practitioner in charge of any patient in a mental health facility shall be entitled to examine and at the discretion of the person, retain any letters addressed to person with mental illness other than to those mentioned in subsection (1). Section 41 of the principal Act is amended by deleting the words “hospital may refuse to receive any person into the hospital” appearing immediately after the words “charge of a mental” and substituting therefor the following words “health facility may refuse to receive any person into the health facility”. (5) The Director of Public Prosecution shall be notified, within thirty days, of instituting criminal proceedings under this Act in accordance with the provisions of the Office of the Director of Public Prosecution Act. No medical recommendation for admission of a person to a mental health facility and no medical certificate for the purposes of sections 10, 14 and 15 shall be signed by any person owning a financial interest in such mental health facility unless the person in respect of whom the recommendation or certificate is signed, is at the time of signing, admitted to the mental health facility or is lawfully detained in some other suitable place for observation as to his mental condition, by the person who signs the certificate. Where, after a person has been admitted into a mental health facility, the person in charge discovers any defect in the admission procedure or the medical recommendation upon which the person was admitted, the person in charge may require the defect to be corrected at any time within fourteen days after the person is admitted into the mental health facility. (1) Every person admitted into a mental health facility under this Act shall remain admitted until the person leaves, is removed or discharged in accordance with this Act. Where a person who is admitted into a mental health facility escapes, a police officer, person employed in such mental health facility or any other person authorized by the person in charge of the mental health facility may, upon finding such person, convey that person into the mental health facility. Any person who wilfully assists the escape of any person suffering from mental illness being conveyed to or from, or while under care and treatment in, a mental health facility, or who harbours any person suffering from mental illness whom the person knows has escaped from a mental health facility, commits an offence. Any person in charge of, or any person employed at a mental health facility who through wilful neglect or connivance permits any patient in a mental health facility to leave such mental health facility other than under this Act or any other law for the time being in force commits an offence. Any person in charge of, or any person employed at, a mental health facility who strikes, ill-treats, abuses or wilfully neglects any patient in the mental health facility shall be guilty of an offence; but nothing in this section shall be deemed to make it an offence for the person in charge of, or any person employed at, a mental health facility to take steps he considers necessary in the interests of a patient to prevent the patient from causing physical injury to himself or to others. Any licences or orders made by the Board prior to commencement of this Act, shall be deemed to have been issued under this Act. Section 19 of the Health Act is amended in subsection (5) paragraph (c) by inserting the words “including mental health services” immediately after the words “all health services”. (1) The Board shall meet at least once in every month to conduct the business of the Board. The Chairperson shall convene the ordinary meetings of the Board at the premises of the Board. Despite the provisions of sub-paragraph (1), the Chairperson shall, upon a written request by at least five members of the Board, convene a special meeting of the Board at any time where he considers it expedient for the transaction of the business of the Board. Unless three quarters of the total number of the members of the Board otherwise agree, at least fourteen days written notice of every meeting of the Board shall be given to every member of the Board by the Secretary. The Chairperson shall preside at every meeting of the Board at which the Chairperson is present and in the absence of the Chairperson absence, the members of the Board present shall elect one person from their number to preside over the meeting of the Board and he shall have all the powers of the Chairperson. Unless a unanimous decision is reached, a decision on any matter before the Board shall be by a majority of the votes of the members present and voting and in the case of an equality of votes, the Chairperson or person presiding over the meeting shall have a casting vote. The proceedings of the Board shall not be invalidated by reason of a vacancy within its membership. Subject to provisions of this Schedule, the Board may determine its own procedure and the procedure for any committee of the Board and for the attendance of other persons at its meetings thereof. The Board shall determine the procedure for the county mental health councils and for attendance of other persons at the councils’ meeting. (1) If a member is directly or indirectly interested in any contract, proposed contract or other matter before the Board and is present at a meeting of the Board at which the contract, proposed contract or other matter is the subject of consideration, he shall, at the meeting and as soon as reasonably practicable after the commencement thereof, disclose his interest in the matter and shall not take part in the deliberations over, or vote on, the matter. Any contract or instrument which if entered into or executed by a person not being a body corporate, would not be required to be under seal may be entered into or executed on behalf of the Authority by any person generally or specially authorized by the Board for that purpose. Created on Feb. 1, 2019, 6:43 p.m.
Rachel Gichuki 1 month, 2 weeks ago. Prescribe components of the treatment plan? The national government should also develop a social and behavior change communication strategy that addresses issues of stigma and awareness around mental health. The Board should be decentralized and replicated at the county level. Faith Kimunya 1 month, 2 weeks ago. Could we use the term "a person with a mental disorder or illness"
Prevention, promotion and after care should not be put under treatment and rehabilitative services since they are all different yet interdependent. As seen from the bill, most emphasis has been placed on treatment services yet prevention, promotion and after care are equally as important. There needs to be clearly outlined policies and strategies specific for prevention, promotion and after care services.